The heads of seven state lotteries arrived in Washington D.C. to meet with members of Congress and express their opposition to Sens. 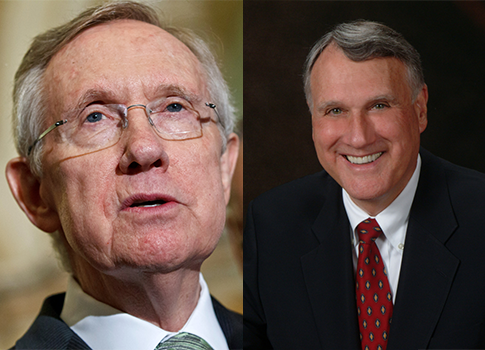 Harry Reid (D., Nev.) and Jon Kyl’s (R., Ariz.) online gambling bill. David Gale, the executive director of the North American Association of State and Provincial Lotteries, and Arch Gleason, director of the Kentucky Lottery, expressed the reasons for their opposition Wednesday morning on a conference call with reporters. Gleason said that lottery directors from Idaho, New Hampshire, Georgia, Washington, Iowa, and Missouri would meet primarily with their own state’s congressional delegations today and tomorrow. Gleason noted that he would be meeting with a member of Senate Minority Leader Mitch McConnell’s (R., Ky.) staff. Gleason said that it is the right of the states to determine whether or not to have online gambling. He and Gale suggested this bill is an infringement of states’ rights. They noted that the National Governors Association, the National Council of State Legislatures, and the National Council of Legislators from Gaming States have all expressed opposition to the bill. "Lotteries need to have the choice of being on the Internet or not," said Gale, so they can "continue to be competitive in the marketplace." The bill would outlaw most forms of online gambling while legalizing and regulating online poker. Gale described online gambling as the "wave of the future." The bill would "restrict lotteries in their online offerings, specifically by prohibiting lotteries from offering any games that are interactive," said Mark Hichar, a lawyer also on the call. Gleason noted that the bill would prohibit online versions of scratch tickets, which can be entertaining and attract younger players. Gleason later said, "Lotteries are incredibly socially responsible." Mark followed up on that comment by noting that states have prosecuted offshore gambling businesses. Gleason also drew a comparison between gambling in the United Kingdom and the United States. He said the expansion of online gambling in the U.K. has not had any negative social implications, while it has allowed them to reach younger players as they reach maturity. Gale said states are "well positioned" to apply the new provisions in the bill "from a technology standpoint," should the bill pass. He noted, however, that states would still have to have a policy debate internally about how they should proceed. Hichar noted late in the call that there is "only one state that is currently set up to license poker operators": Democratic Senate Majority Leader Harry Reid’s home state of Nevada. He noted that the tax structure heavily favors the state in which the licensed operators reside. There is a 16 percent poker activity fee, two percent of which goes to the federal government while 14 percent goes to the states. Of that 14 percent, almost a third goes to the state where the licensed online operator online poker licenser physically resides. The bill lists specific requirements for licensing bodies, including capabilities in regulating poker. "Only one regulatory body that has those demonstrated capabilities, and that is the Nevada gaming control board," Hichar said. "There is not a conventional path for this bill at the present time," said Gleason. If Reid attempts to pass the bill, Gleason said, he would try to attach it to some other piece of legislation. If Reid wants to pass this legislation, he has several options for moving it during the lame-duck session, including attaching it as an amendment or waiting to insert it during a conference between the House and Senate where they hash out differences over another bill. A.G. Burnett, chairman of the Nevada State Gaming Control Board, has asserted that Nevada is "the leader in gaming regulations. Nevada’s Republican Sen. Dean Heller has also asserted that the bill is a top priority for him, Kyl, and his fellow Nevadan, Reid, during the lame-duck session. Updated, 5:30 to clarify who receives the poker activity fee. This entry was posted in Politics and tagged Congress, Dean Heller, Gambling, Harry Reid, Jon Kyl, Obama Economy. Bookmark the permalink.